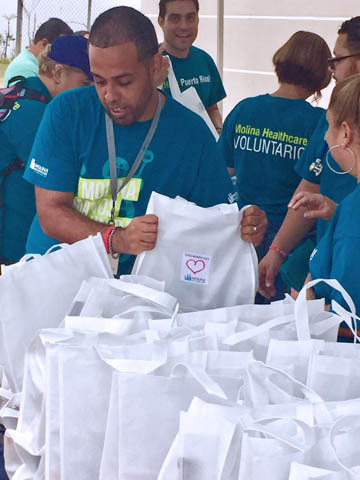 Molina Healthcare employees have been volunteering to help Puerto Rico's Hurricane María victims. Molina Healthcare employees have been volunteering to help Puerto Rico’s Hurricane María victims. Molina Healthcare Inc. skipped its annual corporate holiday party, and instead opted to donate the funds set aside for the event to Unidos por Puerto Rico to continue helping Hurricane María victims in Puerto Rico, company President Carlos Carrero confirmed. This donation is added to the $250,000 that Molina Healthcare Puerto Rico donated to several nonprofits in Puerto Rico that have been offering help, he said. “We thank their generosity and solidarity with the island’s disaster victims as the island continues to recover from this disaster,” said Carrero. “Additionally, through our volunteer program Helping Hands (“Manos Unidas”) our employees will continue to provide much-needed support to Puerto Ricans in need along with community and municipal leaders. Our clinical personnel and our group of primary doctors have offered and will continue with the direct delivery of physical and behavioral health services in rural areas,” he said. In addition to the donation made to Unidos por Puerto Rico, Molina has undertaken more than 20 community efforts in towns around the Island and particularly, in municipalities under their health plan coverage area, including the “Make a Difference Day” in Yabucoa. More than 200 Molina employees and volunteers have helped the Puerto Rico Food Bank to organize and pack 10,000 bags of food that were distributed weekly to communities in need around the island. These volunteers have also worked in the collection center organized by the First Lady’s office. The organizations that received donations from Molina Healthcare are: Unidos por Puerto Rico, Puerto Rico Food Bank, American Red Cross, Salvation Army, Hogar La Perla de Gran Precio, Fundación Causa en Acción Inc., La Casa de Todos Inc., Amor que Sana, and Comité de Educación y Bienestar para Niños y Adolencentes con Diabetes Inc. The help was provided to people in need in the municipalities of Adjuntas, Humacao, Las Piedras, Ponce, San Lorenzo, Yabucoa, Jayuya, Naguabo and Guánica, along with seriously affected rural and hard to access communities like the Punta Santiago sector in Humacao. Molina has also donated and delivered personal hygiene kits and water during many of these events. The health insurer has been teaming up with stateside and federal entities and has facilitated their access to medical services and pharmacy benefits during this time, dispensing with pre-authorization and referral requirements and making it easier for beneficiaries to access medical services inside and outside their provider network, the company noted. Hey Buddy!, I found this information for you: "Molina Healthcare employees skip holiday party, donate event funds instead". Here is the website link: https://newsismybusiness.com/healthcare-employees-instead/. Thank you.